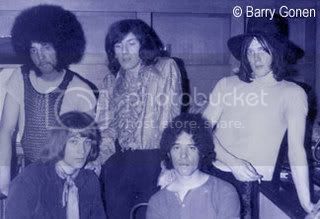 “Psychedelic Soul” was one name invented by reviewers in an attempt to describe the style of music performed by this high-energy West Midlands band. The Breakthru were a popular live attraction who made several notable appearances at outdoor music festivals. Breakthru were formed in 1967 as a professional group and were based in Sutton Coldfield. The members came from a couple of young semi-pro bands; The Clampets who were an R&B band from the Kingshurst area of Birmingham, and The Set who were a pop group from Castle Bromwich. The original members of Breakthru were Keith “Smoke” Abingdon (guitar), Bobby Booth (bass guitar), Geoff Garratley (Hammond organ), and drummer Jim Leyland. Breakthru were fronted by the charismatic and afro-equipped Gary Aflalo who more than filled the position of lead vocalist. Gigs were booked by the Richardson Entertainments agency of Birmingham. The original concept of the band was to establish an exciting live act that would combine soul and Tamla standards with self-composed progressive music. Some reviewers who attended a Breakthru performance would describe the band’s music as “Psychedelic Soul” which was probably a good description of it for that time. The Breakthru soon became a popular live act who played most of the well known local venues in Birmingham and throughout West Midlands. The group also had a residency at London’s Marquee Club as well as playing bookings all over the U.K. which included performances at outdoor music festivals. By 1968 there were a few changes to the Breakthru line-up with Jim Leyland leaving to be replaced by drummer Richard “Plug” Thomas, and Frank Farrell replacing Bobby Booth on bass guitar. A significant booking for the band was the Woburn Abbey “Festival of Flower Children” held in August of 1967. This three day event also included such famous names as The Jimi Hendrix Experience, The Bee Gees, Eric Burdon, and The Small Faces amongst others. The festival was hosted by the influential British DJ John Peel (film footage of this concert still exists). Breakthru also performed at the highly-rated Plumpton and National Jazz and Blues festivals (for more information, check out The Archive – an excellent website that profiles the great UK rock festivals from 1960 to 1975). Breakthru were signed to the Mercury Records label in 1968 for whom they recorded a single. The A-side entitled Ice Cream Tree was composed by Tom Loach, while the B-side Julius Caesar was a song composed by the bands’ manager Russell Thomas. According to drummer Richard Thomas, the record was not a good representation of the band’s sound at that time. The single was released in November of 1968 but apparently had no success in the record charts. A follow-up single Peer Gynt remained unreleased. 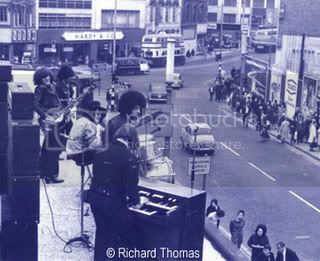 One of the more unusual performances by the band was a gig played on the roof of Nelson House clothing shop on Birmingham’s Bull Street. This ground-breaking event was organized to drum up publicity for the opening of the new store and it pre-dated the Beatles famous rooftop concert by a year! 1969 saw more changes to the Breakthru line-up when Birmingham School of Music graduate Bill Hunt replaced Geoff Garratley on the Hammond organ. The recording of a proposed Breakthru album of original material for Mercury Records was well underway during 1969 but unfortunately nothing was ever released due to the cancellation of the band’s recording contract. In 1970, the group toured Europe but disbanded shortly after returning to the U.K. with the various members going in their own musical directions. Gary Aflalo went on to a lead role in the famous musical Hair in 1971. Frank Farell (now deceased) played bass guitar with the successful progressive rock band Supertramp and later worked with Leo Sayer co-composing his No. 1 hit record Moonlighting. Keith Abingdon carried on as a working musician and composer. Bill Hunt became part of the first live line-up of the Electric Light Orchestra (see The Move) and later became a member of Roy Wood’s chart-topping band Wizzard. He is now a music teacher. Richard Thomas moved to London and worked with American guitarist Joe Jammer before joining the respected prog-rock band Jonesy with whom he recorded three albums. In 1974, Richard Thomas formed the group “Gold” who were originally a pop act but later became one of the most successful bands to record advertising “jingles” during the 1980s. Richard also formed a recording group with former Breakthru band-mate Keith Abingdon called “Spot The Dog” under which name they released a couple of good (though non-charting) singles during the early 1980s. Richard is still a full-time musician and song writer, also producing music for TV. and photographer Barry Gonen who has supplied wonderful photos of the band. i worked this your father but i have four strokes i am trying to rebuilt my life. any info would herp me.Kelvin. Hey Mark, is that the Tom Loach who recorded a kids’ record called The Magic Swing? I happen to be listening to it as I type this, and thought I’d do some googling to find out what it is. The way I remember, I never actually saw the original record and don’t know who in the family (if any) it belonged to, but a taped copy ended up in my grandparents’ house and I found it there one day… as a result, around 25 years later, I’ve very little idea what this record actually was! I’d be interested to hear from you if you pop back in here. I am kelvin edwards and i knew your dad in the 70s. if you want to contact me please do. i have had 4 strokes and i is hard to talk and my memery is no so good.